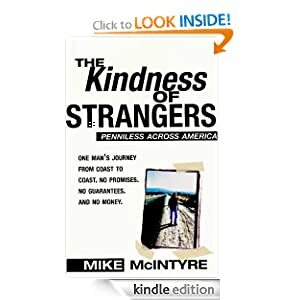 -- As featured on Oprah, The Kindness of Strangers is the story of one man's continental leap of faith -- and the country that caught him. Stuck in a job he no longer found fulfilling, journalist Mike McIntyre felt his life was quickly passing him by. So one day he hit the road to trek from one end of the country to the other with little more than the clothes on his back and without a single penny in his pocket. Through his travels, he found varying degrees of kindness in strangers from all walks of life--and discovered more about people and values and life on the road in America than he'd ever thought possible. The gifts of food and shelter he received along the way were outweighed only by the touching gifts of the heart--the willingness of many he met to welcome a lonely stranger into their homes...and the discovery that sometimes those who give the most are the ones with the least to spare.